Countertops can be expensive to replace and even the smallest chip or burn can stand out in your beautiful kitchen. Badger Bath specializes in countertop refinishing, repairing and countertop resurfacing. Refinishing your countertop can save you lots of time and money. If your countertop is worn out, scratched, chipped or stained, Badger bath can make an inconspicuous repair or if necessary refinish your countertop for a fraction of the time and money of replacment. Every countertop is different, but typically a countertop can be repaired in an hour or two, or be refinished or resurfaced in less than a day. Repairs require a 24 hour cure. Refinishing your countertop requires a cure time of 72 hours. We use the best tools and techniques in the industry. Most countertop repairs will be inconspicuous or very close to invisible. 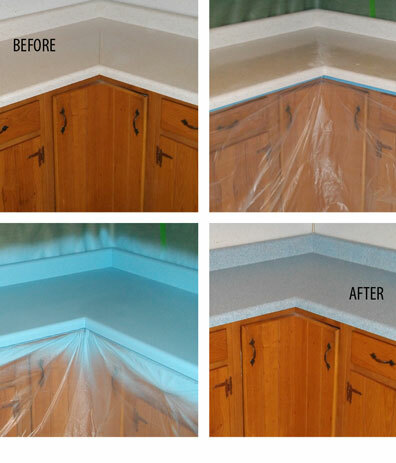 Our trained countertop refinishers are experts at matching color and textures of your existing countertop. Your new counter is available in a 79 colors, finishes, textures and shine levels. All testing and customer feedback shows our finish is every bit as durable as Formica but looks much nicer. 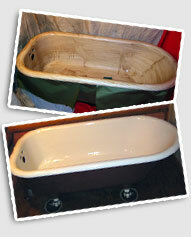 All Badger Bath countertop repairs and refinishings come with a 100 percent satisfaction guarantee and warranty. We use the highest quality products available on the market and our customer service and quality are unsurpassed. Contact us for a FREE consultation. Our professional staff will have your countertop looking brand new in no time. Please refer to the photo gallery for pictures of this process.